Researching sustainable intensification of livestock systems to improve productivity and minimise environmental impacts was the focus of a workshop in Bangor. Chloe Palmer reports. Finding ways to increase production from existing farmland while minimising the impact on the environment summarises the Sustainable Intensification Platform (SIP) research programme. This was according to Michael Winter, of the University of Exeter, who pointed to the challenges of meeting the rising demand for food and the ‘political balance’ which needs to be achieved to do this in ‘an environmentally friendly way’. The workshop focused on research carried out at Bangor University’s grassland research farm, Henfaes, on the northern edge of Snowdonia, and examined the findings of a project looking at farmer collaboration in the Conwy Valley. Dr Prysor Williams, senior lecturer in environmental management at the university, emphasised the role of sheep farming in the Welsh economy and wider society, and suggested sustainable intensification has particular relevance to the sheep sector, not least because of the potentially significant impact of Brexit on sheep producers. He said: “Climate change means that by 2050 some areas which now produce lamb in the southern hemisphere will be less able to do so. “In the UK, sheep have a vital role to play because they are able to utilise poor quality land to produce high quality protein. The research project at Henfaes focused on the scope to increase grass production without compromising the environment. Different plots on the upland part of the farm received varying amounts of inputs such as lime and fertiliser. Some were rotationally grazed and others set stocked. Metrics such as greenhouse gas emissions and the number and diversity of mammal species recorded on site were measured. Lamb performance on each of the plots was monitored using liveweight gain, body condition scores and days to slaughter as parameters. 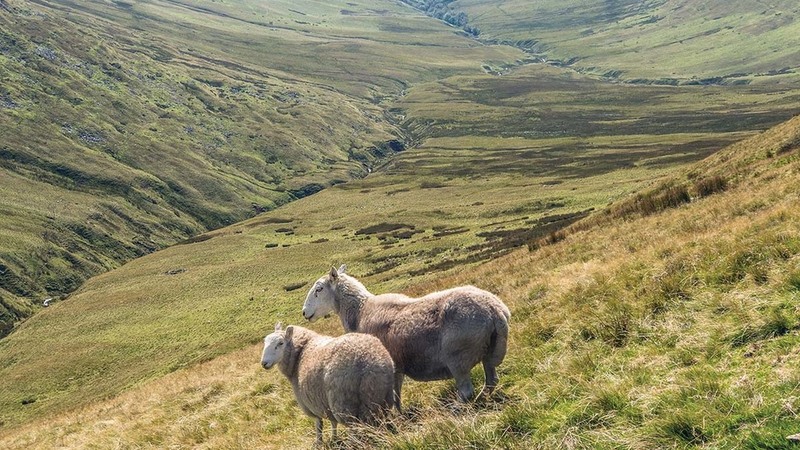 “Greenhouse gas emissions were highest on those trial areas which were improved, but this was partly offset by the increased production of lamb. Up to seven tonnes of dry matter per hectare could be produced on the areas which had been improved and received the highest levels of input,” Dr Williams said. Precision soil sampling of the fields revealed differences in nutrient status of the soils across the area and this could inform variable rate applications of nutrients. “Avoiding over-application of fertiliser on areas where it is not needed will reduce the impact of nutrient loss to the environment. Our financial analysis shows applying additional inputs to grassland does not always pay off, even when grass production is increased. When lamb prices are low, our modelling showed the extra cost incurred will often not be outweighed by the value of the animals sold,” Dr Williams said. The research also examined variations in trace element levels in the grass in collaboration with the University of Nottingham. “Cobalt, selenium and copper are vital trace elements for lamb health and growth and levels of trace elements in the grass fluctuated through the season. The re-seeded grass leys contained lower levels of trace elements, but this might be because the grass grows faster so levels of trace elements in pasture is reduced,” Dr Williams said. He concluded there were ‘lots of things farmers can do to increase production without compromising the environment’, and increasing efficiency by better utilisation of grass and avoidance of waste is a good starting point. Farmer collaboration was another strand of the SIP research. Sophie Wynne-Jones, from Bangor University, worked with a group of 46 farmers in the Conwy Valley to examine drivers facilitating cooperation and the benefits farmers gained from it. Ms Wynne-Jones said: “We found more farmer collaboration than we expected, with all but one farmer in the Conwy Valley involved. While financial drivers might be the primary motivation for cooperation, once the groups are formed, environmental and social reasons became more central. The SIP has used data from the Farm Business Survey and environmental metrics to develop a benchmarking tool to measure environmental performance. Paul Wilson from the University of Nottingham has led the research to develop a tool which would allow farmers to input farm data and information about the practices they were carrying out to better understand the environmental impact of what they were doing, alongside a measure of the financial gain. For example, grassland farmers could see how changes to stocking rate, or the implementation of a nutrient management plan, or a change to the timing of slurry applications to grassland would affect farm profitability and greenhouse gas emissions or nitrate losses. Mr Wilson said: “If farmers are looking to adopt sustainable intensification measures they can use the benchmarking tool to help them decide the most appropriate ones to take up so they can understand where best to focus their efforts.